Looking to make a tasty treat for Father’s day? We’ve got three great option to suit all tastes and level of skill too. Open the can of beer and pour out about half the beer (tip into a glass to drink!). This will keep the chicken moist as it cooks. 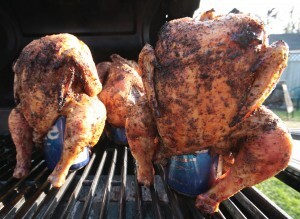 Pop the chicken onto the can, legs down, so that it looks like it is sitting upright with the can in its cavity. Stand the chicken and can upright on the barbecue, either in the roasting tin or directly on the grill, on the side with no coals. Close the lid and cook for 1 hr 20 mins until the chicken is browned, the meat tender and the juices run clear. A good old barbecue meat mix. A barbecue is perfect for a party of guests. Ensure you have a great selection of meats to keep Dad happy. 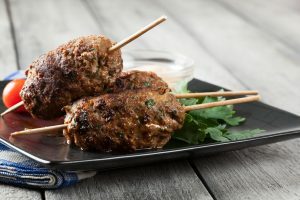 We like Beech Ridge Farm sausages and burgers (keeps the kids happy too and don’t forget we have our great 4 for 3 offer on too) marinated chicken breasts, Chinese chicken drumbsticks, chicken kebabs and lovely lamb koftas. Chop or grate the onions (we like to grate them so they mix better into the mince) and add to the mince along with the parsley and mint, pine nuts, spices, salt and pepper. Using your hands squidgy and squeeze the mince until is combines together. 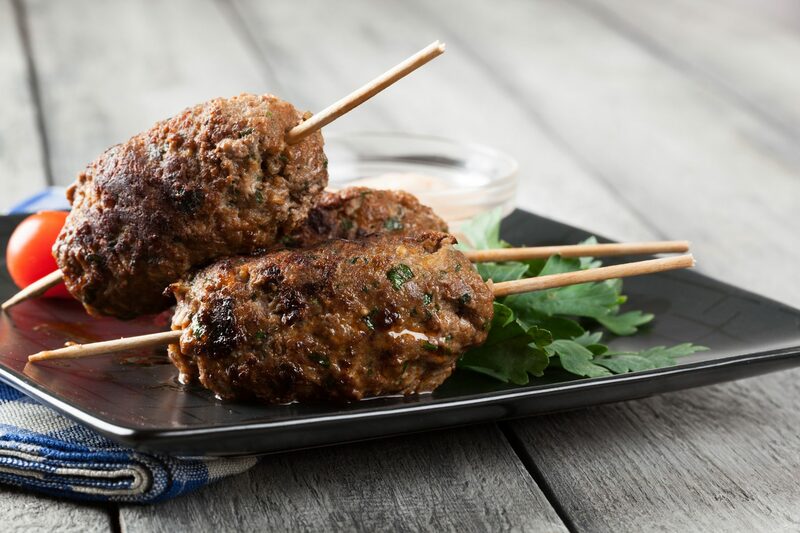 Shape into fingers around metal skewers (if you are using wooden skewers, remember to soak them in water to stop them from burning when cooking). Cook on a medium heat barbeque until golden brown on all sides. Serve with flat breads, mint and cucumber yogurt and a fresh green salad – perfect! Heat oven to 200C/180C fan/gas 6. Tip the breadcrumbs, herbs, zest and Parmesan into a food processor with 1 tbsp of the oil and some seasoning. Blitz until everything is finely chopped. Heat the remaining oil in an ovenproof frying pan. Season the lamb, then brown it well on all sides and turn off the heat. 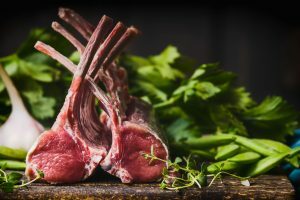 Turn the racks so that they are fat-side up, and brush liberally with the mustard Pack over the herb crust and drizzle with a bit more oil. Roast for 25 mins until the crust is golden and the lamb is cooked – this will produce lamb that is pink in the middle but cooked all the way through. If you like your lamb rarer, roast for only 20 mins; if you like it more done, give it 5 mins more. Put the lamb on a board to rest. Serve with your favourite veg or a spring salad and sautéed potatoes. Happy cooking, we hope you enjoy one of our three great options for Dad’s and Grandad’s this year. Happy Father’s Day. This entry was posted in On the Farm, Products, Recipes. Bookmark the permalink.